Calculating your PointsPlus values using the Plan Manager is extremely simple. You can either search for the exact food that you’re eating in the search box, or if you can’t find it there, you can just enter the food’s nutrition information from the label in their PointsPlus calculator. 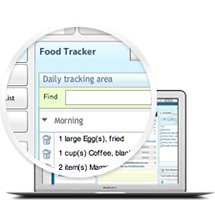 It will give you a PointsPlus value that you can then enter into your daily food log. I don’t think I realized before just how much I was eating every week! 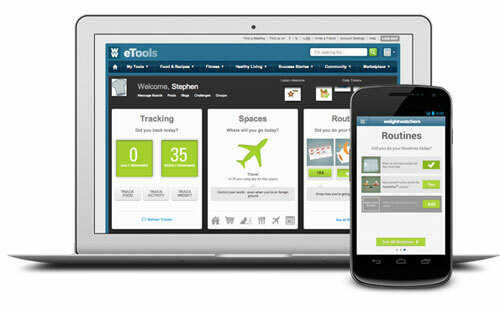 I also like the fact that the eTools are tailored either for men or for women. That means your experience will be better tailored for you! Weight Watchers also now has a helpful mobile tools for folks to use. They’ve got apps for the iPhone, iPod Touch, and for other smartphones like Blackberries. I use the app for iPod touch which allows you to track your PointsPlus values online, and which also syncs with the Plan Manager on the eTools that I talked about above. It makes it easy to track your PointsPlus values even while you’re on the go! If I’m out at a restaurant I’ll track my values on my iPod, which then syncs to my online account. Then when I get back to my desk my values are already entered. The mobile apps also have plenty of other tools including daily recipes, motivational stories from other folks losing weight, points calculators, cheat sheets and more. My wife and I have attended 3 meetings now for Weight Watchers. Basically you show up and weigh in for the week to see if your weight is up or down. They record your weight so that you can see your progress, and if you reach one of your weight loss goals, they’ll recognize you in class. Then the class leader will go over the topic for the week, usually having to do with eating, exercise, motivation and so on. You don’t have to talk if you don’t want to, but the leader does encourage engagement in the class. I wasn’t sure what to expect before I headed to the meetings to be quite honest. I had a pre-conceived notion that they wouldn’t be very helpful for me as I don’t really need a lot of encouragement in my weight loss journey. I’m pretty motivated, and am a self starter in most things. On the other hand, what I’ve found from the meetings is that they are actually pretty informational as well. They help you to change your mindset about eating, give you helpful tips and tricks for eating right and exercising, and of course they are motivational in that others give you praise when you do well, and encouragement when you don’t. I also thought that the meetings would be all women. I was wrong…. somewhat. In the meetings I’ve attended so far, I was the only guy there in one of them, and was the second guy in the other two. So it is mostly women at our location, but I don’t think that should deter any guys from going. While my wife and I are attending local meetings for Weight Watchers, I found that you don’t have to do the program that way. There is an online only version of the program, and I’ve read about a lot of folks doing it that way with good success as well. I know that some guys who would be hesitant to do the weekly meetings might be more open to doing the weight loss program online. If I wasn’t attending with my wife I’d probably be more likely to do it that way. When joining Weight Watchers Online you would have access to your own full program and tools for tracking your progress. So far I have had a pretty positive view of the Weight Watchers program. I think I had a different notion what it would be like going into it, than it actually turned out. I had an image of a bunch of unhappy people who were going to meetings to make each other feel better, but instead I’ve found a motivated group of folks determined to better themselves and encourage each other along the way. I’ve also found the program itself to be much more helpful than I realized – helping me to change how I think about eating, helping me to adjust my portion sizes, and get back into a workout schedule. So far in only 2 weeks of the program I’ve lost 8 pounds, and I think I’ll be reaching the first 10 lbs lost at this week’s weigh-in. Weight Watchers says that typically people who follow the plan can expect to lose 1-2 pounds per week, so I guess I’m not doing too shabby. I have a feeling it will get even better once I start working out more than I currently am. If you’re looking for an easy to do program that shows results, I’d happily recommend giving Weight Watchers a shot.